Earlier this year Steve Carter joined AutoCare, to provide technical training to the AutoCare network, specifically the newly updated Institute of the Motor Industry (IMI) EV/PHEV courses, which have superseded the old-style hybrid courses. AutoCare have an IMI Approved Centre for training in Bradford, and in this year alone over 200 garage technicians and motor factor staff have completed IMI EV/PHEV qualifications. According to industry legislation, to be fully qualified to service and repair electric & plug-in hybrid electric vehicles technicians must complete two IMI accredited qualifications; EV/PHEV Routine Maintenance Activities Level 2.2 Award and EV/PHEV Repair & Replacement Level 3 Award. Both of these courses are available as part of the AutoCare Technical Training Calendar. 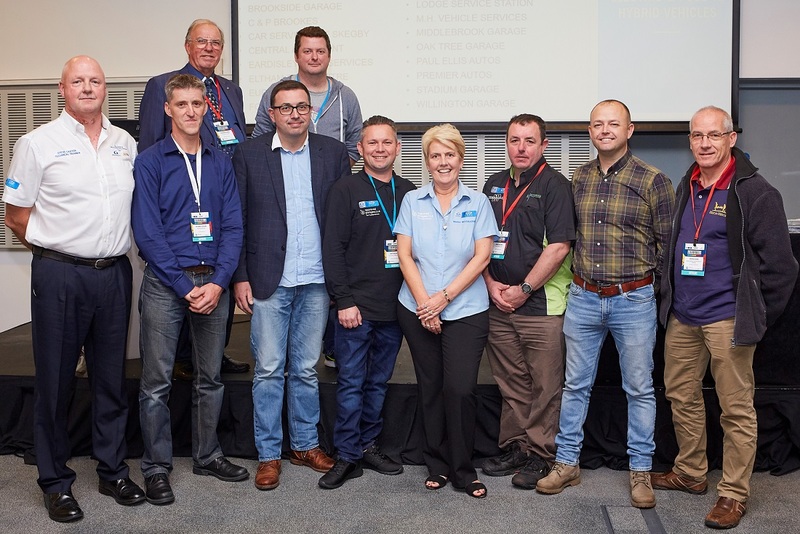 At the AutoCare Annual Garage Trade Show, held at the Exhibition Centre Liverpool in October, the garage technicians who have completed both qualifications were recognised amongst the training awards and presented with a ‘Fully Qualified’ plaque to display at their garage. Congratulations to James Colling (AJ Automedics Ltd), Boyd Swarbrooke (Almark Garage), Austin Barrett (Ansa Motorworks), Richard Oldham (Ansa Motorworks), James Woodfield (Barry's Autos), Brian Flood (Brian Martin Motor Vehicle Repairs), Jon Hollins (Bridge Garage), Steven Millican (Bridge Garage), Neil Bent (Brookside Garage), Rodney Mills (C & P Brookes), Philip Tomasevic (Car Services of Skegby), David MacAllister (Central Autopoint Ltd), Tom Creemer (Eardisley Auto Services Ltd), Edward Davies (Euro Car Services), Carl Thursfield (Foley Auto Services), Karl White (GKC Motors), Kieran Lowndes (Hissey's Garage), Daniel Hogg (Hogg MOT Service Centre), Barry Forster (Hope Street Garage), Justin Sinclair (JA Services (Ripon) Ltd), Stewart Moss (Ledbury Exhaust & MOT Test Centre), Mick Southworth (Lodge Service Station Ltd), Matt Hanson (M.H. Vehicle Services Ltd), Ashley Crook (Middlebrook Garage), Charlie Thompson (Oak Tree Garage), Chrissy Errington (Oak Tree Garage), Michal Gajdosik (Paul Ellis Autos), Adam Pountain (Premier Autos), John McDonald (Stadium Garage Ltd) and Manos Zannas (Willington Garage Ltd). These independent garage technicians are among the first in the UK to become fully qualified to service and repair electric & plug-in hybrid vehicles.